7 AM: I get up and eat breakfast (toast and a cup of tea) before travelling to work. 8 AM: I arrive at work (this is early for scientists, most of my workmates arrive at about 9 AM but I like to get up early!) After checking my email the first job of the day is to turn on the microscope above. It is similar to microscopes you may have used at school but with a few added features including a special camera. 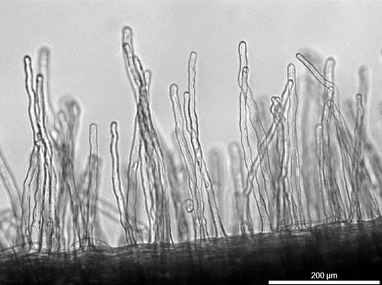 I am fascinated by plants and in my research I am trying to find out more about how some plants (including peas and beans) can form a friendly relationship (known as symbiosis) with soil bacteria, which provide nutrients that the plants need to grow. I use the microscope and camera to study living cells in plant seedling roots (where the symbiosis is set up). 10:30 AM: Tea break and seminar. I have a tea break with some of my workmates and then go to a seminar where other scientists talk about their research and we discuss it afterwards. Seminars are a great way to find out what experiments other scientists are doing, and to get ideas for new experiments to try. 12:30 PM: I have lunch with my friends. 1:15 PM: More experiments. For some of my experiments I have to grow plants in greenhouses. Today I visit to check on my plants and collect some to take measurements. This involves digging up the plants and cleaning them to look at their roots. This is fun, but messy! 3:30 PM: Afternoon tea break. 3:45 PM: Data analysis. I spend the last part of the afternoon drawing graphs of the data I have collected today and thinking about what it shows (does it answer the research question? Do I need to do further experiments?). I also spend some time reading research articles to find out about experiments other scientists have been doing. 5:30 PM: Hometime! Once I am home I have dinner and then relax. One of the things I love about being a scientist is the feeling of discovering the “unknown”. 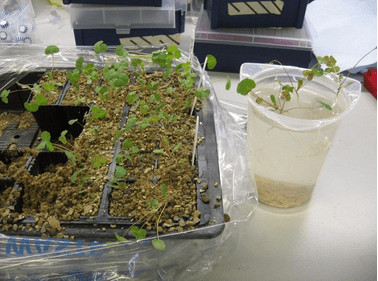 The experiments I carry out reveal little details that when combined with other scientist’s data can help us build up a picture of how the plant-bacteria symbiosis is set up so that pea and bean plants can get the nutrients they need to grow. We hope that this knowledge might be able to help improve farming in the future. Sarah Shailes is a plant scientist working at the John Innes Centre, Norwich, UK. She studies how some plants can form a friendly relationship (symbiosis) with soil bacteria, which help the plants gain nutrients they need to grow. When she isn’t in the laboratory she enjoys knitting and hiking, and helps run a local Brownie Guide unit. Meet the woman who scored a goal against Arsenal!